I am a tenured professor at the famed School of Cinematic Arts at the University of Southern California and have given master directing workshops around the world for more than two decades. Over this time, I've learned a lot about both directing and teaching. I have also been directing feature films and television movies and series for four decades winning many international and national awards including an Emmy, and as Chairperson of Special Projects for the Directors Guild of America, I have had in depth discussions with hundreds of directors about their approach to directing. A collection of these conversations is in two books I edited called DIRECTORS CLOSE UP, Vol. 1 and Vol. 2; and on the DGA website in a section called Visual History which has over 180 detailed interviews with directors and their teams. The theory and practice presented here are a fusion of many, sometimes differing, methods on the art and craft of directing. Also, this is a living document. My colleagues who created SCALAR have made it so we can easily add to what we create. I will be inserting new comments and clips when appropriate to inspire and expand your understanding and practice. We also are encouraging you to comment and contribute further examples of the subjects discussed here. No matter what you do in your life, these abilities will be of value. They are about awareness, communication, and efficacy and will serve you well, whether you are a director, a journalist, a poet, an entrepreneur, a lover, a friend or a parent. To see better: what we see is not just governed by the limits of the optical capacities of both the eyes and the neurons of the brain, but it is also influenced by how we have been raised, our nurturing, how we have been trained to perceive the world, and develop our predilections and our prejudices. People who encounter the same object do not always see the same thing. In fact when you are thinking about something, you may visually miss many things that actually occur in front of you. For example if you are driving late for work, listening to the news, you may miss seeing the ads on the billboards; or if you are horny and looking for an appropriate companion, you may not notice anyone other than a potential playmate. Or if you are very hungry and looking for a place to eat, you may not see how attractive someone else is on the street, or what the dog looks like that you just past. I am repeatedly reminded by my newer students, working on scenes that they bring in with actors, how, as directors, they don't see what the actors often do, particularly if there are more than two actors in the scene. When I ask, "Did you see that particular gesture, or that specific behavior?" Oftentimes the new director will remark that he or she in fact did not notice. Part of the problem is our minds are always busy even while we are seeing, and often busy with something other than what we are seeing. And in many cases we are actually prejudiced toward what in fact we see. The philosopher Wittgenstein observed: "All seeing is seeing as." The story is told about a five-year-old boy who's been taken out to a restaurant by his father, a fancy restaurant, and as the meal proceeds, the young boy looks around and suddenly says to his father, "Look at that black man giving the white man orders." The father looks around and sees a white maître d' talking to a black waiter. So, the father says, "No, actually the white man over there is giving orders to the black man. " "No, Daddy. Look." The father looks again and what he sees in fact there is a man in a black tuxedo giving some instructions to a man in a white waiter’s outfit who happens to have a black face. In my first classes I often show a series of optical illusions to further illustrate how limited our seeing can be. Take a look at some of these below. NB: Should you have any trouble playing any of these clips throughout this document, click on "details" at the bottom right which will take you to another panel that has an option of "permalink" and click on this and the clip will play from that location. Hearing is even more complicated in that we have, as we grow, an internal voice or voices that are constantly commenting on what is happening while it is happening. Even as you read this, you may be noticing that interior voice. We have these commentators who are continually telling us how we feel about what is occurring, how we plan to respond to what we are experiencing, so that our capacity to actually listen is often muddled by these internal critics. When we were kids, we all played the telephone game which is another illustration of how quite quickly what is said by one person is unheard by another and incorrectly passed on to the point that within ten exchanges it often doesn't even relate to the very first exchange. There are in fact four levels to any verbal communication. The first is what we mean to say, the second is what we actually say, the third is what the other hears, and the fourth is how that is interpreted by the one who hears. And there is also hearing the tone of how something is spoken. It's been observed that communication is less than 20% the actual words that are spoken. The way the body and face move as words are spoken and the sound of the words themselves, all intertwine to affect the way we actually hear. As directors we need to develop the skills of a more objective witness to what we see and hear. So there is a learning curve for the director to step outside the boundaries of his or her ego. On the one side we say that a director should have a personal vision and offer us a new way of seeing the world, but to actually do this, as professionals, we have to develop our abilities to see and hear what is actually happening outside and in front of us. As the spiritual philosopher Krishnamurti put it: "Observe and then act." We are talking about the developing of awareness itself. Oftentimes the new director gets distracted by thoughts and internal commentary. In this way he or she can't see the whole. It is as if they pay too much attention to an individual cloud and don't see the sky that contains everything. It is this expanding and expansive awareness that comes with seeing and hearing better. Let's take a look at two challenges that illustrate the value of a wider perspective. As you see, to solve the problem you need to step outside the box. Try this challenge. You know the Roman numerals: I = 1. X = ten, V = 5. C = 100. So by adding only one line, can you make a 6 out of - I X. 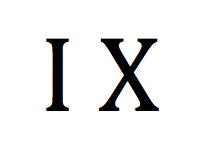 You know from the above that in Roman numerals that equals 9. How do you make it then into a 6 ? Right, you add a line that makes an "S" in front of the I X and you get S I X. This is about seeing more possibilities than seem to be there. Finished files are the result of scientific study combined with the experience of years. Count again. The mind often doesn't allow us to really see what is there. The third primary goal mentioned above is - knowing what you want. This in itself can be a lifetime query. It comprises understanding your own tastes. And these are both instinctual and intuitive. Instinctual in the sense that, who you are already, on an essential almost bio-chemical level, knows what you like. Intuitive in the sense that you can learn to hone your tastes and abilities so you can alter how you perceive what's in front of you. This second aspect of intuition implies that you can teach perception. Just as a musician and composer exposed to the masterworks of the centuries are able to incorporate in his or her own creations a deeper understanding of the art form, so too a director who expands his or her experience of that art form and of life can better create cinematic expressions. Back in the 1970s, the director Elia Kazan gave a speech about directing and in this he spoke to all the assets he believed the director needed to develop, which included familiarity with literature, theater, dramaturgy, comedy, music, painting, history, movement, design, costume, lighting, camera, sound, editing, architecture, topography, nature, acting, psychology, eroticism, economics, politics, food, and above all self-knowledge. His entire speech is included in the first volume of DIRECTORS CLOSE UP and on The Directors Guild website as a downloadable pdf document [http://www.dga.org/The-Guild/Committees/Special/Special-Projects.aspx]. To explore the fourth and fifth goals: to know how to get what you want and to know when you’ve got it, will be much of what is in this presentation. As we are concentrating here on film directing, there are many specific skills needed to master this form of artistic expression. You have to have vision and leadership abilities, but there is one area of this profession, that you are solely responsible for: and that is helping the actor give a performance. If a director has developed these five skills he/she can motivate their actors to do deep and powerful work. How these performances then get “captured” effectively on film is the other primary role of the directing process. So this presentation, is divided into two sections: the first is about performance, and the second is about camera.